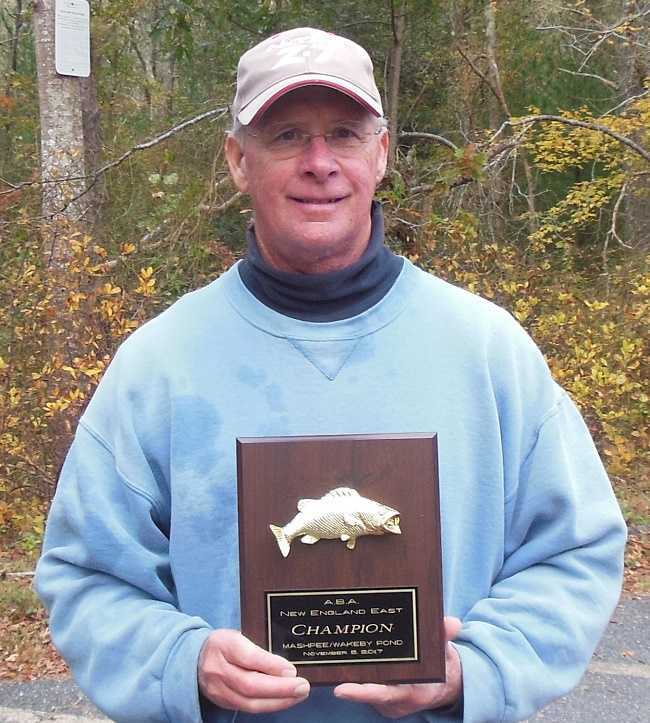 On Sunday, November 5, 2017, George Smith of Bourne, MA won the AFT Division 5 event held on Mashpee/Wakeby Pond, Mashpee, MA. It was a cold, cloudy and windy day with a brisk Northwest wind at 10- 20 mph. These conditions made for a tough bite and only one 5 fish limit was brought to the scales. George was the angler who did that and his limit weighed in at 11.29 lbs. George caught his fish in a grass covered isolated flat and used a floating Senko when the wind was slack. However, when the wind picked up, he'd cast a weighed tube bait, into that same flat, and that was the pattern that enticed the bass to eat. When the scales were closed, George was declared the Champion of this event. Big bass of the day was caught by Dan Rose and it was a huge 5.59 lbs. smallmouth bass and it edged out Mike Capaldi's largemouth bass of 5.42 lbs. 1. George Smith 5 fish - 11.29 lbs. 2. Dan Rose 3 fish - 7.23 lbs. 3. Vern Santos 3 fish - 5.96 lbs.